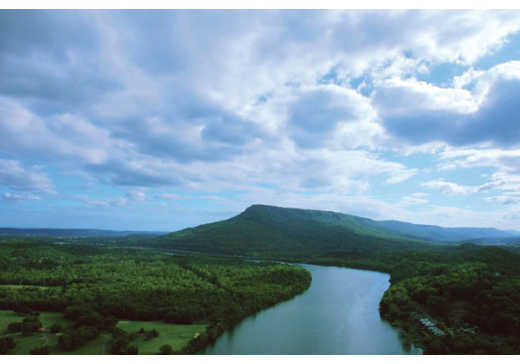 Lookout Mountain stands tall and proud, high above the Chattanooga skyline. The mountain hosts a variety of activities from miles of hiking and biking trails to Civil War history to world-class attractions. 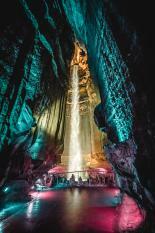 Being a Chattanooga transplant, I had no idea what to expect when I visited Rock City. Like everybody else, I’d seen all the signs and the painted barns. The enchanted trail surprised me with the vast size of the garden and the extraordinary nature of the rock features. The star of the show is Lover’s Leap. Jutting out from the mountain, this stronghold of rock boasts an impressive view. Explore Fairyland Caverns to see happy gnomes, fairytale folklore, and ultraviolet lighting. Upon reaching the end of the trail, a small plaza with leather crafting, gift shops, and delicious fudge awaits you. Bragging Rights: You’ll have seen seven states from one location! Ruby Falls was remarkable. It’s easy to see why so many people love it. The elevator itself seemed like its own attraction. Through its glass panels, I watched hundreds of feet of rock zip past on our descent to 260 feet underground. On our expedition, I discovered hidden underground streams, stalactites and stalagmites in all shapes and sizes, and many other types of amazing cave formations. The winding path through the caverns leads to the beautiful 145-foot Ruby Falls, named after the wife of founder Leo Lambert. Bragging Rights: You’ll have visited the deepest commercial cave in the United States and seen the largest underground waterfall accessible to the public! Get your adrenaline pumping with High Point ZIP Adventure at Ruby Falls​. With unmatched views of the Scenic City, the three courses offer loads of excitement with ladders, nets, walkways, bridges, tunnels, and zip lines. You can test your skills on the 40-foot Climbing Tower and soar high above the ground with 700 feet of round-trip zipping on the Tower ZIP Ride. As the Lookout Mountain Incline Railway crawls up the mountain, the view becomes more and more breathtaking. I’ve got to say, there’s something beautiful in slowing down and enjoying the experience. Near the top, the railway reached the 72.7% grade and made my stomach turn a little. It’s the same feeling encountered at the top of a roller coaster before the first drop. Even without the views and the one-of-a-kind experience, I’d go back just for that feeling. Bragging Rights: You’ll have ridden the world’s steepest passenger railway! While you’re on top of Lookout Mountain, take a moment to brush up on your Civil War history. Updated in 2016, Battles for Chattanooga features a new, digital projection-mapped show allowing guests to visualize Chattanooga&apos;s Civil War history as the battles come to life in a digital panoramic display. Stand where soldiers fought during the “Battle Above the Clouds” at Point Park. 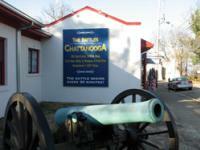 This is definitely the place to start a Civil War history tour in Chattanooga. There’s so much to do here that it’s impossible to see everything in just one day. Experience it all and save money by combining tickets and lodging with Chattanooga vacation packages.